We sailed into Nassau, Bahamas sometime last October and I couldn’t wait to see this island for the first time. Not knowing much about the island, we didn’t have any exact plans when we got there. With my background in travel, we have traveled most places by private car and driver. If I can give any travel advice, this would be high on my list. It’s not as expensive as you may think (in most places) and it allows you to go wherever you want, stop when you want and connect with your local driver on a personal level to learn more about the destination you are in. With this is in mind, we immediately hired a local cab driver / guide for a private tour of the island. 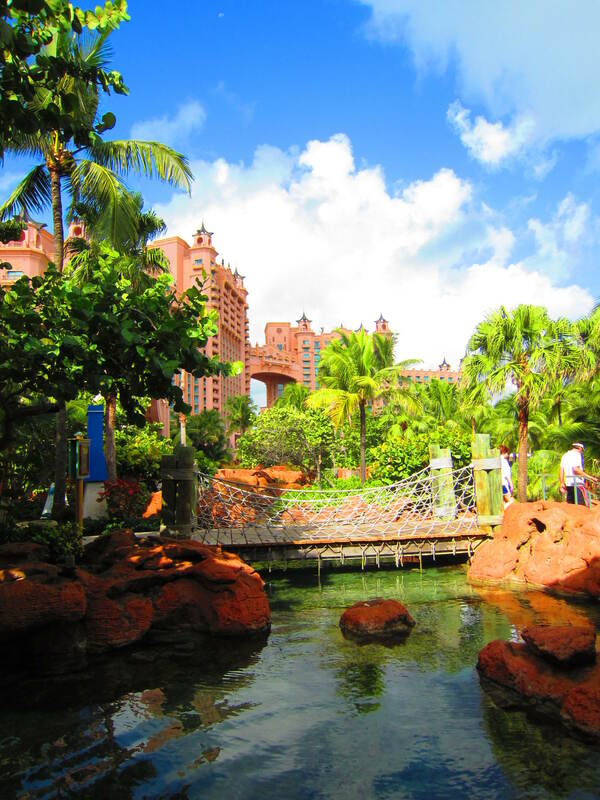 We had to make the obligatory stop to check out the Atlantis Resort. 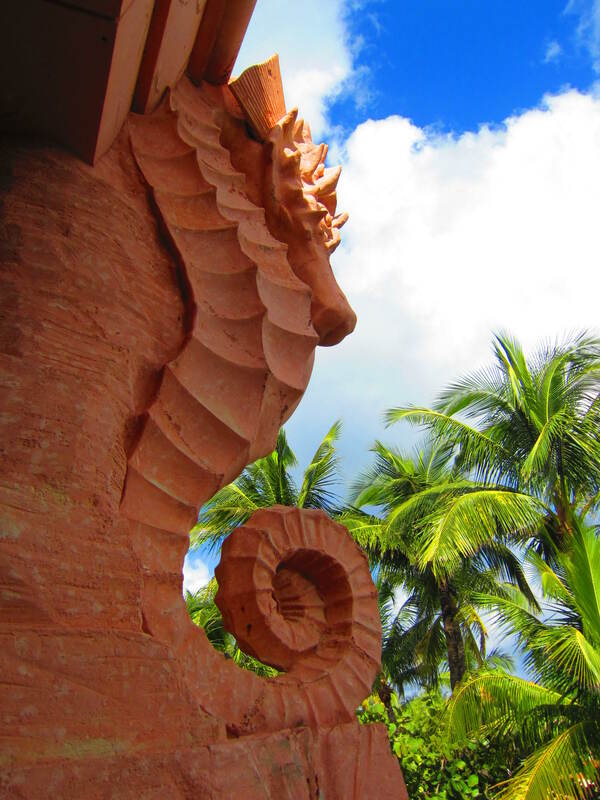 While it is a themed type of resort the architectural details, landscaping and views are worth taking in. 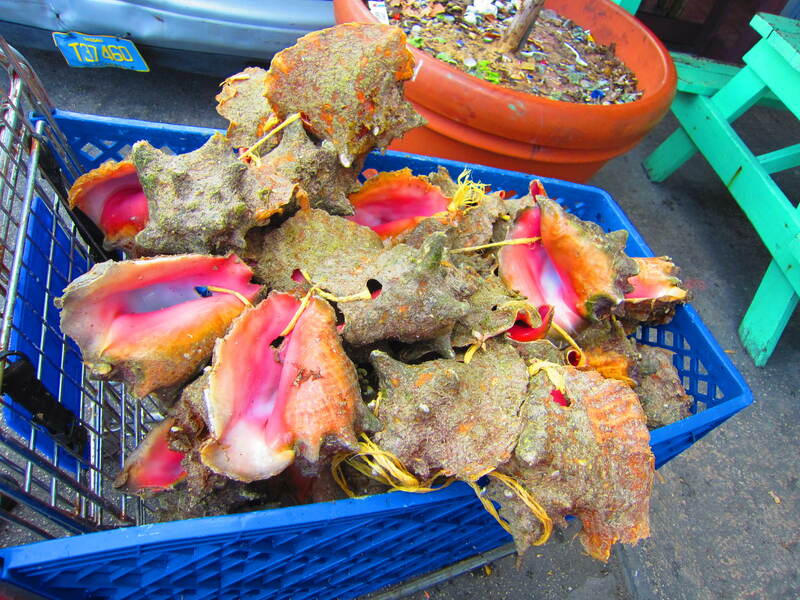 One thing I definitely wanted to try while in the island was conch. Wanting an authentic experience, our driver took us to this row of small conch shacks along the water’s edge, where the local divers are selling their day’s catch. It was a Sunday and therefore kind of quiet but we were able to watch our conch salad made by hand right in front of us with fresh conch, minutes removed from the water’s depths. It was refreshing but a little chewy, kinda like raw octopus. I think I may have preferred it cooked. Something to try next time. We continued our drive to the high point on the island, on old military outpost, to take in a beautiful panoramic view of land and sea. Rather than drive down the hill our driver showed us a hidden pass through, carved into the side of the hill, known as the Queen’s Staircase. 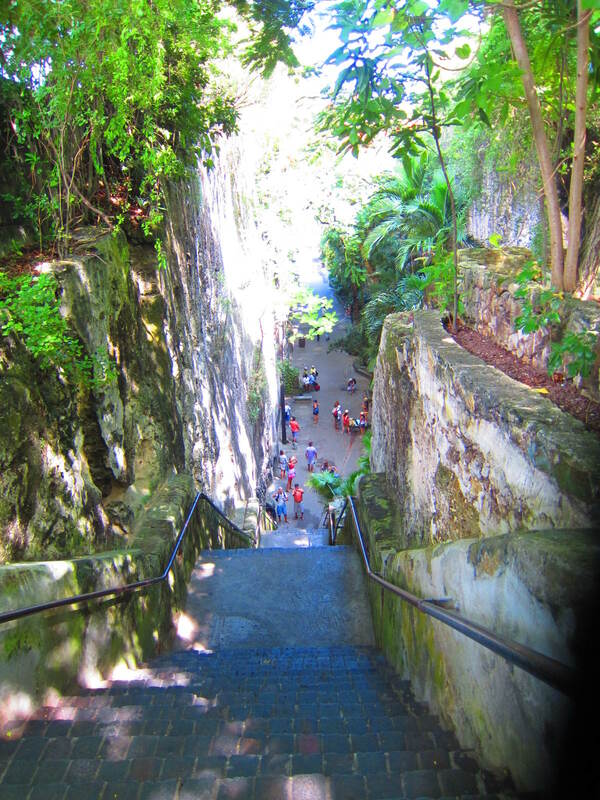 What seems like an endless amount of stone steps leading to the bottom of the hill, covered in a canopy of lush, verdant palms created this refreshing breeze filled walkway to get back to the car. I was glad were walking down the steps. I may not have liked it all so much if we were headed in the opposite direction. We continued on our drive around the island, taking in the pristine beaches. We were able to see some of the neighborhoods and stop for refreshments along the way. During this drive we learned some of the history of the island, new developments taking shape and local culture, all from our driver. Again, the benefit of having your own car and driver and being able to go off the “tourist path”. We ended back our tour back at the port and I was ready for some shopping. 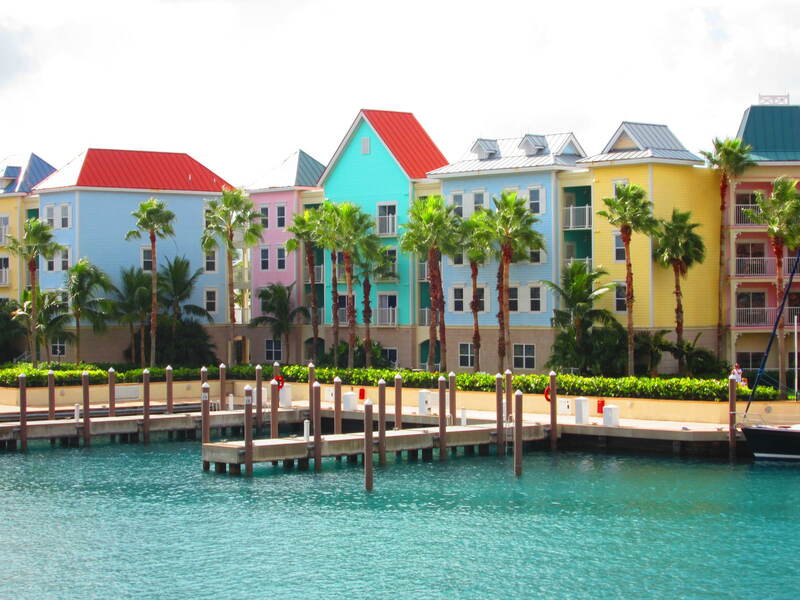 All the shopping is centrally located in the Port Lucaya Marketplace. There are high-end retail shops on one street, endless souvenir shops on the other and in the middle is the Nassau Straw Market. I am always in search of the local arts and crafts. What are people making by hand that is unique to this place? While they offer intricate wood carvings and handmade shell jewelry, the straw crafts are the star of the show. Row after row of stalls in the market are selling straw in all forms from hats, to placements to handbags. The bags are the most abundant, which made me happy because I am all about jewelry and accessories. A few steps into the market, I bought this small straw clutch from an elderly woman who was making them by hand in her stall. I haggled a little and got if for $11. It’s lined with floral print fabric and has a unique woven design on the front and back. I thought it was the perfect size to travel home with and would be a great natural accessory to add to my closet. We continued around the market and in hindsight I should have done a once over of the place to check out the variety of products first. 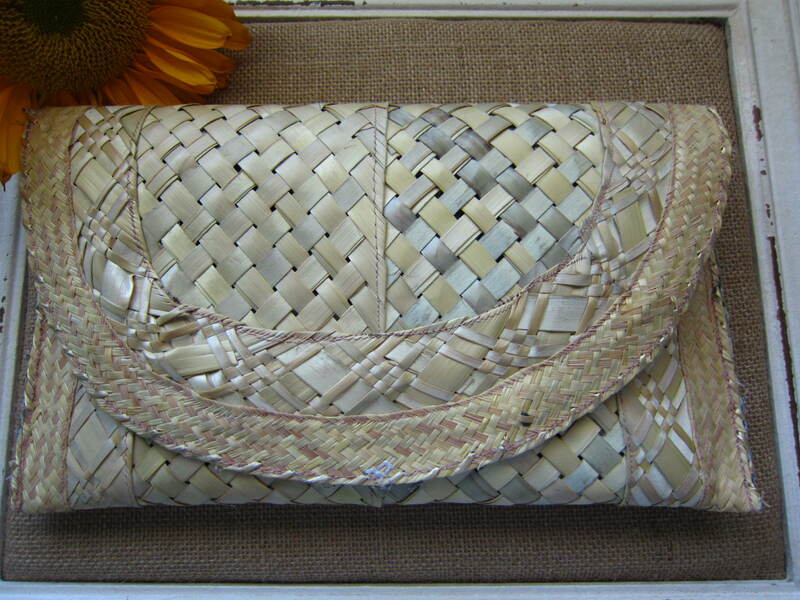 I ended up falling in love with a more structured, bolster shaped two toned straw bag with bamboo handles. Oh it was magnificent. It was the only one I saw in that shape in the entire market, it looked well made and expensive. I haggled with the seller, back and forth, even tried walking away and she wouldn’t come down to the price I was willing to pay. I really wanted it but having just bought a smaller one, I couldn’t justify spending a lot on the second one. Needless, to say, I still think about that bag. The one that got away. Which brings to mind another one of my global shopping rules, if you love it, buy it! I let a small difference in price keep me from having a really unique item that I still reminisce about today. I encourage you to get away from the crowds and walk down the side streets when hunting for unique finds. 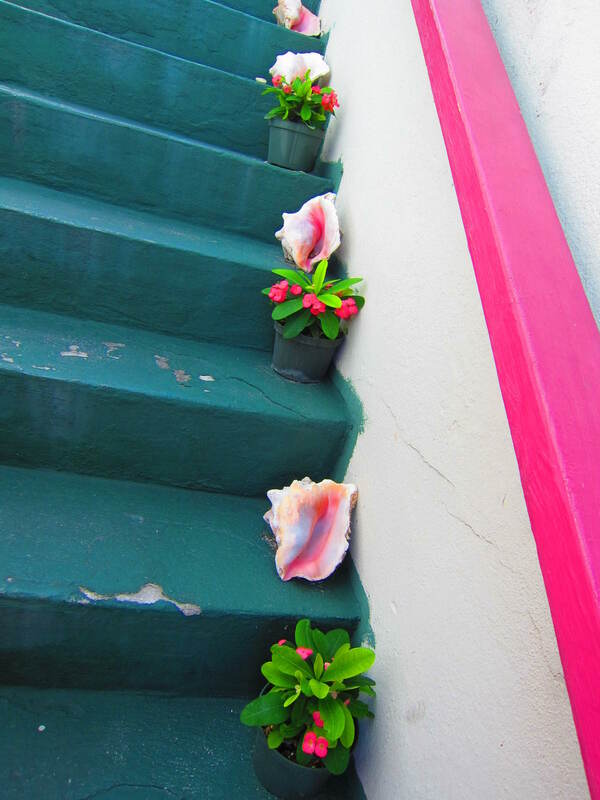 We walked a few blocks and found this lovely, flower and shell lined staircase that led to a one of a kind gift shop. This store sold only items made by local Bahamian artists, from paintings to jewelry to hot sauces to candles. This is the type of place to pick up truly interesting items as gifts or for yourself, while supporting local artists. I can’t remember the name of the shop and can’t find it online. You’ll just have to look for these stairs when you are there! All in all, our day spent on the island of Nassau was enjoyable and didn’t put too big of a dent in my pocket (I was kind of impressed with my restraint!). The natural sites and stunning beaches are not to be missed. Each time I use my straw clutch, I’ll remember the picturesque island I bought it on and the woman who created it. 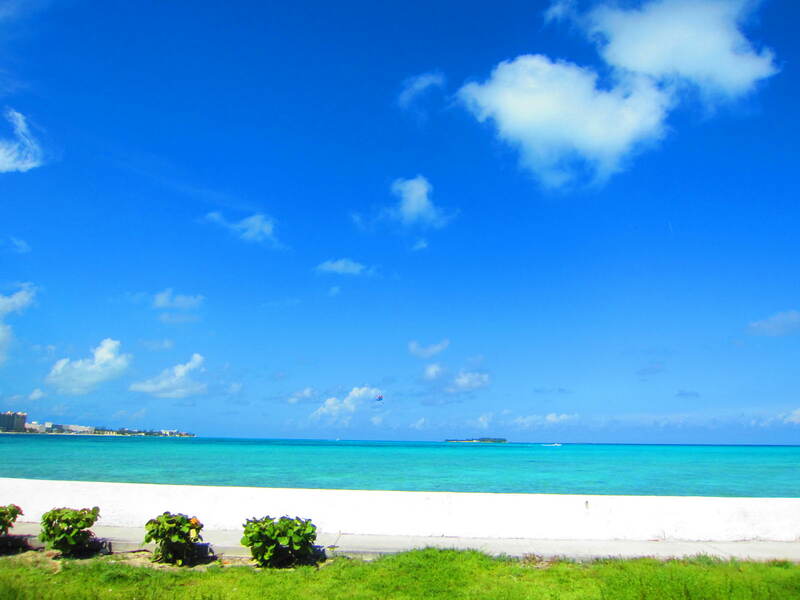 Sounds like you had a wonderful day in Nassau. And I agree with you — if you really love something, buy it. You’ll never regret it. We did and yes, one should strive to come home without any shopping regrets! Thanks for reading!